Red Hot Rebellion was founded on a singular principle: to rebel against the watered-down excuse for rock of the status quo. The trio offers volume, speed and fervor – perhaps a throwback to a simpler time when rock ‘n’ roll was dangerous, a time where music was more important than fashion and where intensity and vitriol was more important than whining about breakups and heartache. Fans of Zeke, AC/DC, Motorhead and Rye Coalition will immediately recognize the musical universe from which these gentlemen channel their power. When did you begin writing the material for your most recent LP? The upcoming release is an EP and we started writing at the end of last summer. Although one song (“Junkyard Jesus”) was one of the first songs we wrote when we first formed in 2010. We shelved it but then started playing it out again last year. The response was good (and a demo version of it was licensed for use in two different MTV shows: Nitro Circus and Rob Dyrdek’s Fantasy Factory) so we decided to re-record it and put it on this EP. Probably “You Bring The Thunder, I’ll Bring The Lightning.” It was the newest of the songs written before we hit the studio and it is a BLAZING song filled with smoking guitar riffs and lots of starts and stops. We stretched ourselves on this song and it was a little harder to get it super tight when recording. We don’t use any ProTools tricks (like quantizing or autotune, etc.) with our recordings. It’s all done live with minimal over-dubs. This is a conscious decision to give the music more raw power and a live feel. But sometimes it can be harder to “nail” a take like you want. This one took a while. We had a pretty clear vision for this record and everything turned out pretty much liked we envisioned it. One song, however, went from cool to SUPER COOL in the studio is “Alright Alright.” We did some neat things with vocals and the addition of extra percussion and keys that took it to the next level. No, but I took on an extra duty by playing keyboard on “Alright Alright” and tambourine and sleigh bells on some others. Also, Chris Suttle (who also engineered and co-produced the EP) sang gang vocals with us. He’s like the honorary fourth member of Red Hot Rebellion at this point. We co-produced it as a band with Chris Suttle (In The Red Recording Studio). Chris is a friggin’ genius and a delight to work with. In addition to being a super skilled engineer, he knows when to push musicians and when to back off and let them figure things out for themselves/experiment. The sound of this EP is BIIIIIIIG and it’s largely due to Chris’ production style. One example is the guitar solo in the song “Melt The Sky”. There’s actually two guitars soloing at once — which works because Doug Spencer is an awesome and thoughtful guitarist who gives spot-on performances — but using two guitar solos on top of one another was totally Chris’ idea (and wouldn’t have been something we would think to try ourselves) for the final mix. And it works really, really well. 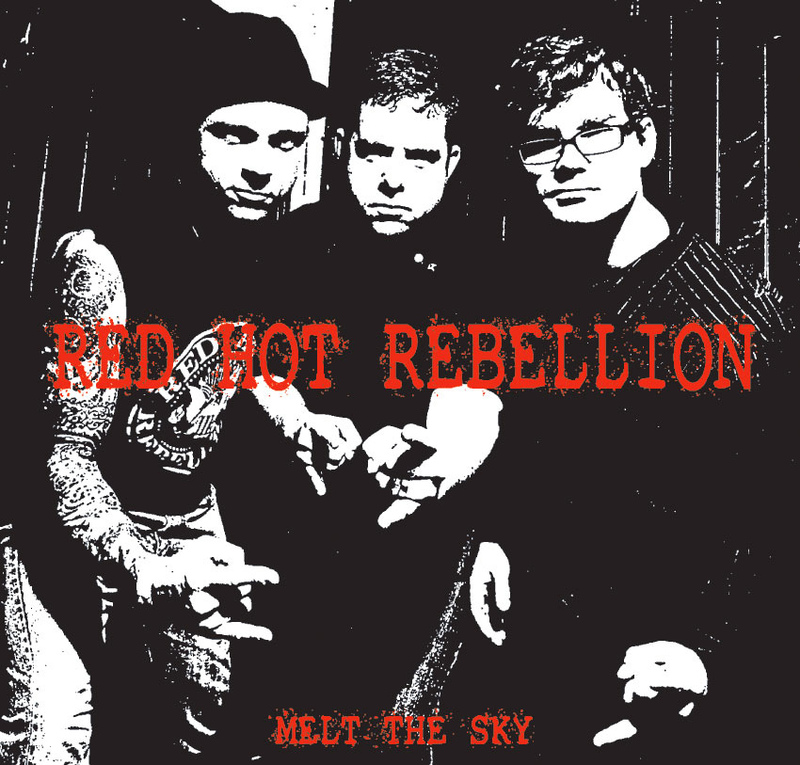 Red Hot Rebellion is a band from another planet sent here to set rock and roll back on its proper path. Of all the intelligent cultures in the galaxy, only a few create their own music. And of those, a smaller handful create rock n roll. A thriving rock scene is a prerequisite to joining the galactic union of more advanced planets. Earth started out OK and then it all went terribly wrong. Red Hot Rebellion was sent here to correct that (This story will be played out in the second issue of the RHR comic book).